Facilities: USP Atwater with an adjacent minimum security satellite prison camp. 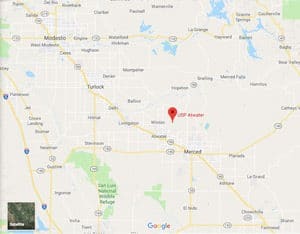 Location: USP Atwater is located on a portion of the former Castle Air Force Base, about 130 miles from San Francisco. Background: USP Atwater is located on land formerly part of Castle Air Force Base. Notable incidents include two inmates (convicted of murder), that attacked and stabbed a corrections officer, who later died in the hospital. Notable inmate Bobby Banks, leader of the Crips street gang in Little Rock, Arkansas (convicted of conspiracy and drug trafficking for a large-scale crack-cocaine distribution operation was sentenced to 55 years), also appeared in the 1993 HBO documentary Gang War: Bangin’ In Little Rock. Health Services: Health services at USP Atwater include emergency medical services, physical examinations, examinations for inmates 50 and older, medication, dental sick call, and reading glasses. Inmates are assigned to a specific medical care provider who treats them for the duration of their stay. Emergency medical care is available 24 hours a day. Psychology Services: USP Atwater provides intake screening, assessment, treatment of mental health and drug abuse problems, individual and group counseling, psycho-educational classes, self-help and supportive services, and referral to Health Services for medical treatment of a mental illness. It also offers specialized mental health programs and the Challenge Program (an intensive, residential program for inmates with mental health problems). Residential Drug Abuse Program (RDAP): USP Atwater and the camp do not house a Residential Drug Abuse Program (RDAP), but referrals can be made to institutions which do provide RDAP. Both facilities provide drug abuse programs, a Drug Abuse Education Course, and the Non-Residential Drug Abuse Program (NR-DAP). Education Services: USP Atwater offers literacy, GED (in English and Spanish), and English-as-a-Second Language (ESL), programs. Incentive awards are provided to recognize inmates making satisfactory progress and successfully completing the literacy (i.e., GED and ESL) program. Inmates may also receive incentives for progressing to various levels in the GED or ESL programs. Graduation ceremonies recognize GED, ESL, and Occupational Education completions. A parenting program is also available. Adult Continuing Education (ACE) may also be offered in subjects such as typing, computer literacy, foreign language, and business skills. High school diplomas and post-secondary programs are available through paid correspondence programs. Advanced Occupational Education: USP Atwater and the camp do not offer any advanced occupational education programs. Vocational Training: USP Atwater offers vocational training in Building Trades/Landscaping and Computer Skills – Illustrator and MS Office. The camp does not offer vocational training programs. Apprenticeship: USP Atwater offers apprenticeships for the following occupations: Electrician, Cook, HVAC, and Teacher’s Aide. The camp offers apprenticeships for the following occupations: Landscape Technician, Stationary Engineer, and Teacher’s Aide. Library Services: Leisure and law libraries are available to inmates. A variety of reading materials, including periodicals, newspapers, fiction, nonfiction, and reference books are available at the leisure library. An interlibrary loan program with local, state, and college libraries and available bookmobile services is also available. The TRULINCS Electronic Law Library offers inmates access to legal materials and preparation of legal documents. Typewriters and a copy machine are also available. UNICOR: The USP Atwater and camp UNICOR facilities handle recycling. Commissary: A spending limit of $360.00 per month is imposed. Inmates must have their commissary card in their possession at all times for identification purposes. Popular commissary items include ice cream, snacks, foods, electronics, clothing, drinks, and shoes. Recreation Services: Leisure activities at USP Atwater include organized and informal games, sports, physical fitness, table games, hobbycrafts, music programs, intramural activities, social and cultural organizations, and movies. Art activities include all painting and sketching rendered in any of the usual media (e.g., pastels, crayons, pencils, and charcoal). Hobbycraft activities include crochet and knitting. The camp also offers a number of recreation activities including leather craft, painting, sketching, and bead craft. The housing unit common area is where inmates can play cards, table games, etc. The recreation field hosts many structured activities throughout the year, including softball, track and field, soccer, volleyball, and wellness classes.